True the Vote as a Non-Political "Charity?" True the Vote is best known for hyping unfounded claims of "voter fraud" -- allegedly committed by Democrats -- to justify restrictive voting measures, and training Tea Partiers to act as poll watchers, some of whom have been accused of voter intimidation. Engelbrecht says that after her group applied for 501(c)(3) charitable status in 2010, the IRS followed up with what she called a "gauntlet" of questions, and three years later has not yet acted on their application. 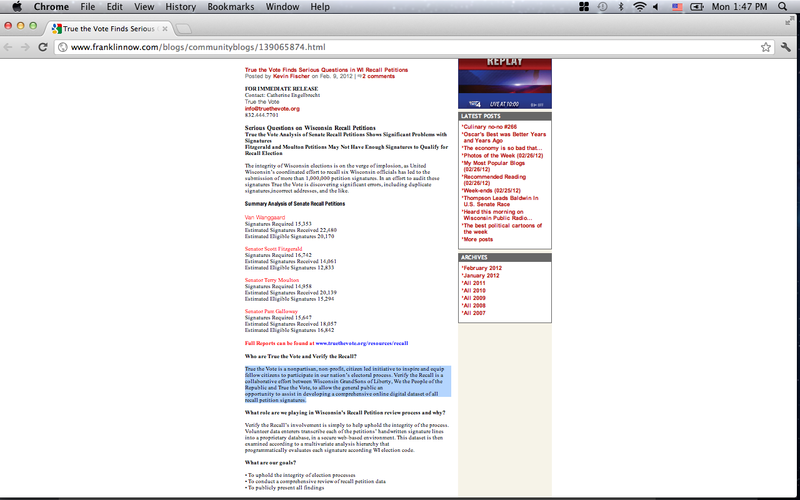 "This is what the beginning of tyranny looks like," True the Vote founder Catherine Engelbrecht told Breitbart.com. What has really raised Engelbrecht's hackles is the IRS asking other Tea Party groups about their involvement in "Verify the Recall," a True the Vote-connected effort that recruited Tea Party volunteers from around the country to enter petitions calling for the recall of Wisconsin Governor Scott Walker into a massive online database, then analyzing signatures for "fraud." "The Verify the Recall questions are one of the more blatant examples of what the IRS is trying to do to us," Engelbrecht said. Engelbrecht is trying to connect True the Vote to the IRS improperly singling-out Tea Party groups for review based exclusively on their names or political views. But the comparison is not accurate. For one, in contrast with the Tea Party groups seeking 501(c)(4) nonprofit status, True the Vote is seeking 501(c)(3) "charity" status, according to its website and news reports. The former can engage in some political activity, but the latter has an absolute bar against any campaign or electoral intervention. Part of the reason for this restriction is that unlike donations to (c)(4)s, contributions to 501(c)(3) organizations can be written-off as a charitable tax deduction -- and Congress long ago decided that wealthy donors should not get a tax break for influencing elections. In the case of the 501(c)(4) Tea Party groups, the IRS erred by singling-out some groups based exclusively on their names or political views, rather than evidence they engaged in potentially excessive political activity. But for the 501(c)(3) True the Vote, the IRS may properly scrutinize its application if there is evidence of any campaign or political intervention. And indeed, there is significant evidence -- and True the Vote likely knows this. 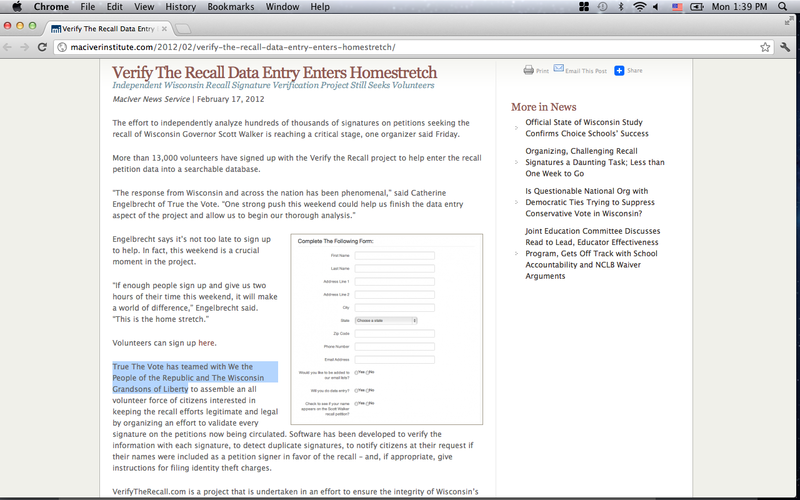 The group's participation in the Wisconsin "Verify the Recall" effort is one example. 501(c)(3) charities may conduct activities like voter registration or get-out-the-vote drives, as long as there is no bias against a particular candidate. But True the Vote's rhetoric surrounding its recall petition "verification" activities made it clear which side they supported. 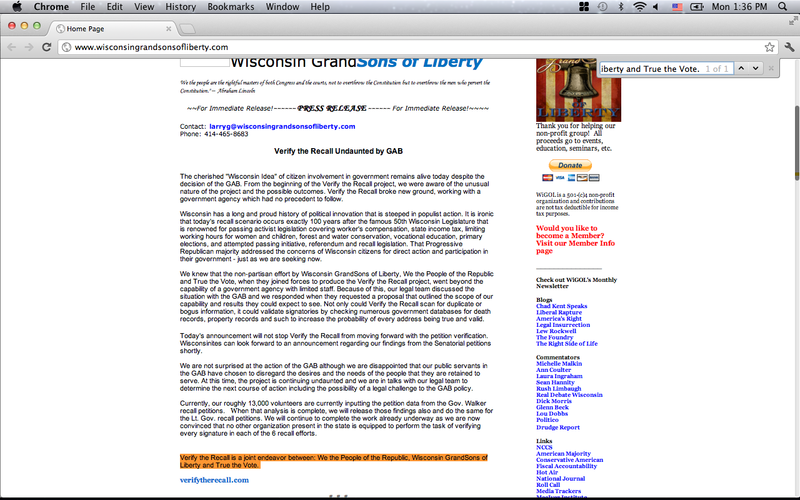 Blog posts, for example, suggested "massive fraud" by Democrats in the recall petition effort and exclaimed that "we should not believe the claims of union-supporters and anti-Walker operatives who say that they collected more than one million signatures on petitions to recall Governor Scott Walker." And the True the Vote / Verify the Recall findings were, at best, extremely sloppy: True the Vote alleged that recall proponents failed to collect enough valid signatures, but even a cursory review of their analysis showed that many of the rejected signatures were entirely legitimate -- perhaps indicating the true goal was to discredit the recall effort rather than "verify" anything. After recall petitions were collected and turned in, the Walker campaign refused to challenge any signatures, and instead asked the state elections board to accept challenges from Verify the Recall (which the board rejected, since there is no basis in state law for accepting such third-party challenges). True the Vote's position on the recall effort, and the Walker campaign essentially accepting their work as an in-kind campaign contribution, raise legitimate questions about whether this is appropriate activity for a non-partisan, non-political charity. And True the Vote appeared to recognize this and tried distancing itself from the Verify the Recall effort. Because of the inherently political nature of the Verify the Recall effort -- and True the Vote's efforts to portray itself as an organization that has nothing to do with influencing elections -- the group may have been trying to cover their tracks. 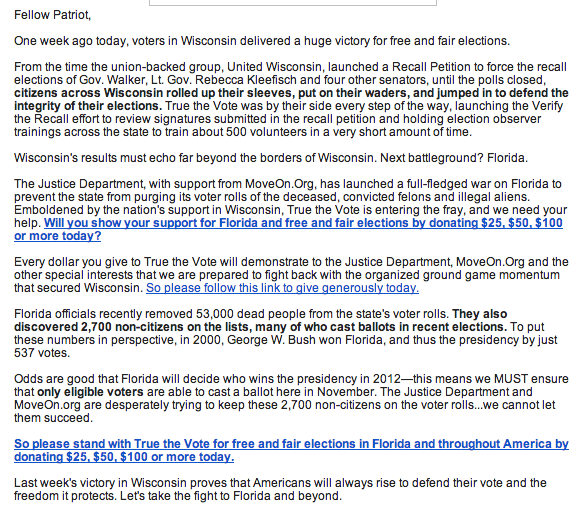 Still, after Walker won his recall election, True the Vote couldn't help but send a celebratory email to its supporters calling the outcome a "victory." Texas Judge: True the Vote's Parent Organization is a "GOP Front Group"
Questions about whether True the Vote is really a "charity" did not start with Verify the Recall: the group's partisan roots have shown almost from the beginning. A 2010 video announcing True the Vote's launch begins with right-wing activist David Horowitz telling the camera "Republicans have to win by at least three percent in order to win an election," since Democrats are so likely to cast fraudulent votes. The video, which features white activists warning of rampant voter fraud, also featured an image of an African-American woman holding a sign that had been doctored to say "I only got to vote once." In the original photograph, the sign read "don't mess with my vote." (The image was later cut from the video). A few months after the video and True the Vote's launch, in the November 2010 elections, the group dispatched its "poll watchers" to districts in Harris County, Texas where most voters were African-American or Latino. They found no hard evidence of intentional voter fraud, but the poll watchers did draw accusations of voter intimidation from election officials, with volunteers "hovering" behind people as they cast their ballot, "getting into election worker's faces," and blocking or disrupting lines of voters. After those elections, the Civil Rights division of the U.S. Department of Justice launched an investigation into the group and its alleged voter intimidation efforts. At the time, True the Vote was described as a "project" of the Houston-based Tea Party group King Street Patriots, which was also founded by Engelbrecht; the 2010 video featured the True the Vote logo laid-over that of its parent organization. And the IRS was not the first to question whether the groups really qualify for nonprofit status. Based on its 2010 True the Vote voter intimidation activities and close relationship with the state Republican Party, a Texas judge called the King Street Patriots a"GOP front group" that had illegally provided in-kind donations to the state Republican Party. Is the Shoe on the Other Foot? True the Vote's profile increased in the 2012 national elections with a pledge to train over one million volunteers to duplicate its Harris County activities, and by threatening lawsuits against states that didn't follow their directive to purge voter rolls. Common Cause and Demos highlighted the group as a central player in the effort to perpetuate the myth of widespread voter fraud -- and the need for restrictive voting laws -- and True the Vote was the subject of a New York Times profile. Its national elections coordinator has made it clear that True the Vote's focus is on policing the act of voting itself. He has said on multiple occasions that True the Vote's goal is to make exercising the fundamental right to vote feel "like driving and seeing the police following you." And here is the irony: a group that made a name for itself by targeting voters is now complaining about itself being "targeted." But unlike True the Vote's targeted voter intimidation tactics, the IRS taking a closer look at True the Vote's charitable status may very well be justified. Submitted by Anonymous (not verified) on May 26, 2013 - 1:34am. FDLE closed the case after state election officials were told by Rhode Island authorities that the name of the voter there was probably wrong and was listed incorrectly because of a poll worker’s error.